Video Watermark Factory - a full-featured yet easy-to-use software that allows placing a digital watermark or logo or text over an existing video in the batch mode. Watermarks can be used for protection or adding comments to your movies. You may impose watermark on a whole video file or on a specified section of the movie. Brand Your Video With A Watermark! Add watermark protection, enhance, resize and convert your videos with Video Watermark Factory, a powerful yet simple-to-use solution for video editing and copyright protection. Do you publish your videos on a Web site or upload them to YouTube? Did you ever have your video spread all over the Internet with absolutely no credit to its author and no hint to its origin? Brand and protect your videos by embedding a digital watermark! TV broadcasters and studios are using semi-transparent images or logos to protect the translations. They have to use expensive equipment and sophisticated software to embed the images into a video stream because of the real-time nature of TV translations. But as you don't have to broadcast your video in real time, you don't have to buy the extra equipment or install complex software packages! Video Watermark Factory is an all-in-one video editing and protection package that allows you to brand your videos with a semi-transparent logo overlay or a digital watermark. You don't have to be a pro in order to enhance your video. Adding a digital watermark is as simple as selecting a video file and an image that you want to appear on top of your movie, and Video Watermark Factory will do the rest. Of course, you can also select the transparency level and position your watermark in the right place in your video. 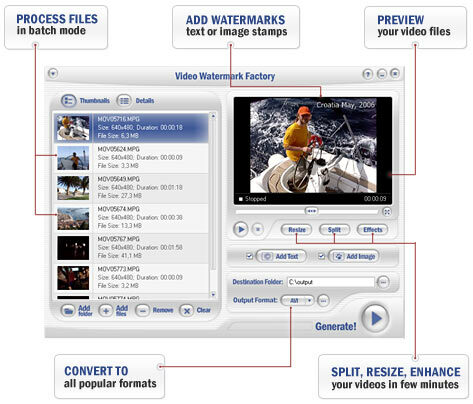 Video Watermark Factory is not limited to video protection alone. Instead, it features a number of useful tools you can easily use to enhance your video. Video splitting allows making a set of small, easy to download files from a long video that would otherwise be impossible to download. Format conversion can make Web-friendly video streams that can be opened with a media player and start playing almost immediately, without the need to download the full movie in order to play it back. Reverse conversion is also easily possible, and you can always make a single movie out of many flicks in different formats. Brand and protect your videos by embedding a digital watermark! Copyright � 2007 VideoWatermarkFactory.com. All Rights Reserved.